All the tracks from Megadeth's iconic 1990 album "Rust In Peace" will be added to the Rock Band Music Store on Tuesday, Harmonix has announced. The tracks will be available for PS3, Xbox 360 and Wii versions of Rock Band. The album is available for the 360 and Wii on Tuesday (Feb. 9), and for PS3 on Thursday (Feb. 11). There are nine tracks in all, and they'll be available for $1.99 USD, £.99 UK, €1.49 EU, or 160 Microsoft Points or 200 Wii Points per track. The whole album is $14.99, £7.49 UK, €10.99 EU or 1200 Microsoft Points. 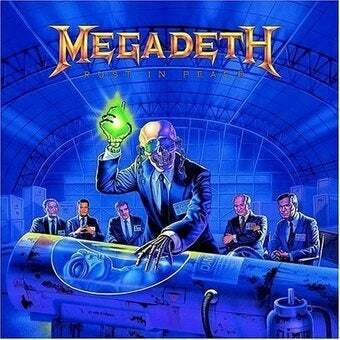 Rust In Peace, commonly cited among the top 5 of the metal genre's most influential works, joins Megadeth's "Peace Sells ... But Who's Buying?" from 1986 on the Music Store. A statement announcing the new DLC notes that Megadeth kicks off a month-long Rust In Peace 20th anniversary tour in March; they'll be joined by Testament and Exodus. Ordinarily I don't print boilerplate from news releases but in the case of what Megadeth frontman Dave Mustaine has to say, I'll let that slide: "This record is one of my favorites from my catalogue, and you will see the twists and turns that make Rust In Peace the quintessential Thrashterpiece that it is!" "Thrashterpiece?" My word, I think I my right hand just unconsciously made devil horns.